A pair of structurally similar new dioxomolybdenum(VI) complexes, [MoO2L1(EtOH)]·EtOH (1) and [MoO2L2(MeOH)] (2), where L1 and L2 are the dianionic form of 2-[(2-hydroxyphenylimino)methyl]-6-methoxyphenol (H2L1) and 2-ethoxy-6-[(2-hydroxyphenylimino)methyl]phenol (H2L2), respectively, were prepared and characterized by IR and UV-Vis spectroscopy, as well as single crystal X-ray diffraction. X-ray analyses indicate that the complexes are dioxomolybdenum(VI) species. Complex 1 contains ethanol as co-ligand, and complex 2 contains methanol as co-ligand. The coordination geometry around the Mo atoms can be described as distorted octahedron, with one imino-N and two phenolate-O of the Schiff base ligand, and one oxo group defining the equatorial plane, and with the other oxo group and one solvent-O occupying the axial positions. 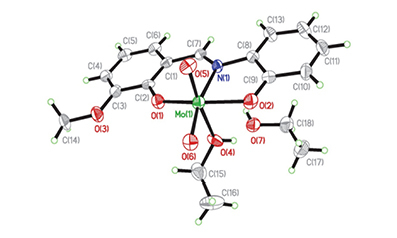 The catalytic oxidation property of the complexes with tert-butylhydroperoxide in CH2Cl2 was studied. Both complexes have excellent catalytic properties on cyclooctene and cyclohexene, and good properties on 1-hexene and 1-octene.